On November 23, IBFAN-GIFA took part in a panel discussion organized by the Right Livelihood Award Foundation on the issue of Working towards an enabling environment for the promotion and protection of the rights to water, land and food – Linking Global Advocacy with Local Action. The other panelists were Maude Barlow, Canadian activist, former Senior Advisor on Water to the 63rd President of the UN General Assenbly and Chairperson of the Council of Canadians, and Jumanda Gakelebone, spokesperson of the First People of the Kalahari, a grassroots organization representing the Bushmen of Botswana. The discussion was moderated by Renate Bloem, CIVICUS UN representative, and the event was co-sponsored by the World Future Council. 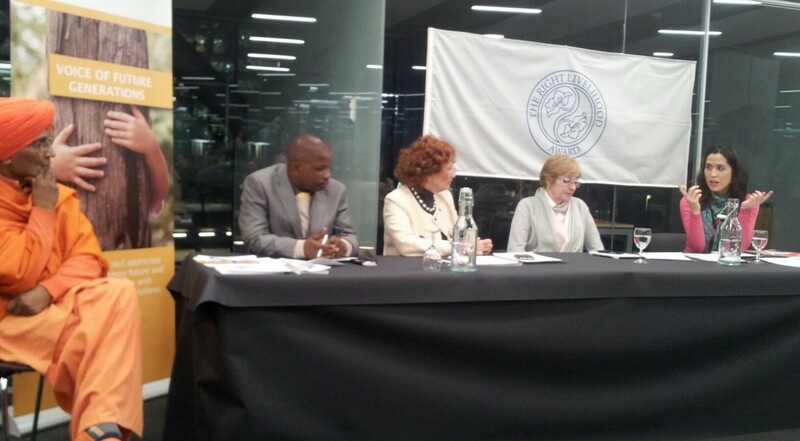 IBFAN, Maude Barlow and the First People of the Kalahari are all laureates of the Right Livelihood Award, known as the Alternative Nobel Prize. Other laureates, namely Swami Agnivesh and Hans Herren/Biovision Foundation, were also attending the event as honour guests. Maude Barlow first took the floor and shed light on the struggles encountered in her advocacy for human rights and the environment, pointing out the investor-state dispute settlement mechanisms (ISDS) enshrined in free trade agreements as main obstacles to the realization of human rights. She emphasized that the power of corporations to use ISDS mechanisms could strongly undermine any agreement on climate change if corporations decide to fight the necessary resulting regulatory changes. Therefore, she insisted on the need to include a reliable and clear ISDS carve-out in any future agreement in order to safeguard it against risks of ISDS lawsuits targeting climate change action by governments. Jumanda Gakelebone then spoke about his struggle for the First People of the Kalahari that face discrimination and forced eviction of their lands. They do not have access to natural resources on their ancestral territories and a woman even died of thirst following the cut-off of water by the government. Hunting is also prohibited to indigenous people on their ancestral lands, while permits are delivered to private companies that sell them to wealthy tourists wanting to display a trophy. Jumanda Gakelebone then highlighted the dangers to which human rights activists from the community are exposed and the double discourse of the Botswana government which adheres to human rights instruments and declarations while it at the same time violates systematically the rights of indigenous people. Finally, Jumanda Gakelebone shared its concerns about the lack of human rights protection of indigenous people, leading to depletion of their natural resources by private companies that are allowed to operate in the country with impunity. Speaking on behalf of IBFAN, Camille Selleger insisted on the indivisibility, strong interconnectedness and interdependence of human rights. She recalled States obligations to promote, protect and support breastfeeding in order to ensure the realization of child’s right to health child, noting that child’s right to health is also closely correlated with people’s access to safe drinking water and land. Therefore, the struggles for the right to land, the right to water and the right to an enabling environment for breastfeeding should not be seen as separate struggles. Indeed, all these rights are included in the concept of food sovereignty, which is a condition for the full realization of the right to adequate food. Camille Selleger then outlined IBFAN’s 35-year long experience that voluntary initiatives such as the Global Compact or the OECD Guidelines for Multinational Enterprises do not work in getting corporations accountable for their human rights violations and empahsized the need for a binding treaty to put an end to corporate impunity. She ended her speech calling all activists in the room to join the Treaty Alliance, a group of organizations, social movements and individuals advocating in support of elaboration process of a treaty on transnational corporations and other business enterprises with respect to human rights. At the end of the panel discussion, Swami Agnivesh and Hans Herren also shared their considerations about the need for promotion and protection of human rights. Swami Agnivesh highlighted the need for human rights to include the very spiritual, sacred nature of humans and their environment, including land, air, water and animals. He called for a renewed commitment of the international community to put this sacred nature of humans and the environment above all laws and conventions as the fundamental principle that should lead any international process and development initiative. He invited all people to join hands beyond the dogmatism of any ideology or religion in order to thrive collectively. He finally called the participants to collaborate with his organization Sarva Dharma Samvaad which advocates for equal respect for all religions in the perspective of optimal human development. Hans Herren stated that human rights are indeed crucial but that most governments do not fulfil their obligations in this regard. He denounced the current trend of governments to initiate public-private partnerships with businesses instead of taking measures to ensure the full realization of human rights. He also stressed the role that each individual should consciously play when it comes to electing representatives or consuming products. He finally noted that Sustainable Development Goals represent a great opportunity for human development and called all partners in the room to support them.